For many within Afghanistan’s once-thriving Sikh and Hindu communities, the attack in Jalalabad city on July 1, claimed by the Islamic State (IS), came as a final blow to the plurality of the Afghan society. Fourteen of their compatriots were killed; among them was Avtar Singh Khalsa, the only Sikh nominee for the upcoming parliamentary elections. A sense of gloom and hopelessness has fallen over the community since and the tragedy has left them rethinking on their place in the country. “Seeing this incident has broken all of our hearts and spirits. 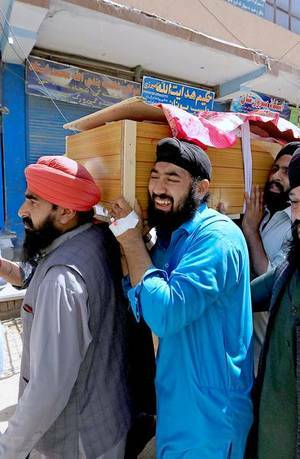 We do not know how to move forward,” said Shyam Singh, an Afghan Sikh from Kabul, at a mass funeral at a local gurdwara in Kabul. Mr. Singh, a tailor, is among the many who have decided to leave Afghanistan. “I cannot afford to leave, most of us can’t afford it, but if we don’t leave, this is how we will end,” he said. A refusal on the part of the Taliban to negotiate peace, alongside a steadily strengthening Islamic State (IS) insurgency, has resulted in an increasing number of civilian casualties over the last two years. However, for the minorities, the threat to civilian life isn’t the only concern. The Sikh and Hindu communities have seen a steady decline in numbers owing to religious persecution, especially during the years of civil war and Taliban rule.